The Unilever Young Entrepreneurs Awards can help you take your sustainability initiative, product or service to the next level. Take a look at what you need to know about the Awards this year. The competition is open to founders or co-founders, aged between 18 and 35 (as of 29 June 2018), of initiatives from any part of the world with the exception of those based in Russia, due to local data protection laws. Initiatives must relate to one or more of the categories: Zero Hunger, Good Health and Well-being, Quality Education, Gender Equality, Clean Water and Sanitation, Decent Work and Economic Growth, Responsible Consumption and Production and Climate Action. Entries must have grown beyond the idea stage to include actions the applicant has already taken – whether through informal networks, via an existing institution, or by creating a new enterprise. Entries cannot be accepted from current Unilever employees, nor can entries promote Unilever or its products. However, the entrepreneur may have worked with Unilever in the past or may be working with Unilever currently as a third-party supplier. If shortlisted, entrants will be required to submit further information in the form of a pitch deck OR business plan, and financial projections, by 21 August 2018 (further guidelines will be sent to shortlisted entries in the first week of August). If shortlisted, entrants will be required to participate in a video call with a shortlisting panel on 11 or 12 September 2018. If shortlisted as a finalist, entrants must be exclusively available to attend all parts of the accelerator programme in Cambridge, UK and subsequent Awards events in London, UK from 25 October to 31 October 2018. Unfortunately, inability to attend any part of the agenda due to a competing commitment will mean participants forfeit their place on the programme. 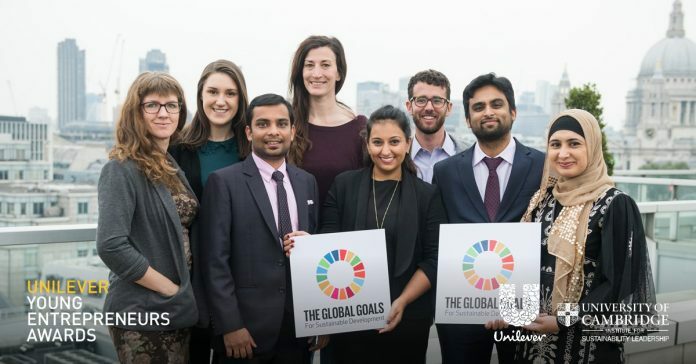 The unique prizes of the Unilever Young Entrepreneurs Awards are designed to lift your initiative to the next level, helping to fuel growth and maximise impact. The Unilever Young Entrepreneurs Awards will recognise up to eight winners, including the HRH Prize Winner, in 2018. The eight winners will be selected from a rigorous assessment process led by The University of Cambridge Institute for Sustainability Leadership, culminating in video interviews with our finalist selection panels. Winners will have a chance to practice their pitches during the Accelerator in Cambridge where they will work with experts from the University of Cambridge, Unilever and other inspirational speakers and guests. All winners will attend a special prize event hosted in London. The remaining winners will each receive a €8,500 cash award and one-to-one mentoring support tailored to their specific needs for a duration of 12 months. Unilever is looking for initiatives relating to one or more of the eight categories we’re focusing on: Zero Hunger, Good Health and Well-being, Quality Education, Gender Equality, Clean Water and Sanitation, Decent Work and Economic Growth, Responsible Consumption and Production and Climate Action. To submit your entry, you’ll need to create a profile and complete the application form. You’ll need to tell us all about your initiative’s story so far, and your vision for its future. The more you can share, the better.